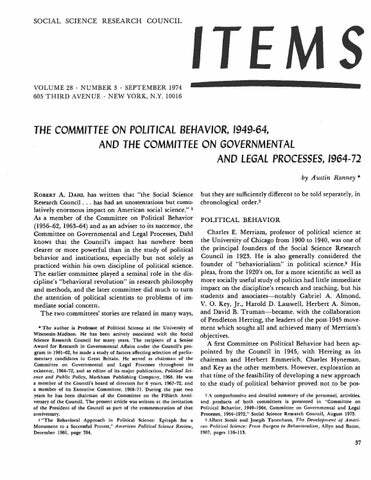 THE COMMITTEE ON POLITICAL BEHAVIOR, 1949-64, AND THE COMMITTEE ON GOVERNMENTAL AND LEGAL PROCESSES, 1964-Tl by A ustin Ranney'" ROBERT A. DAHL has written that "the Social Science Research Council ... has had an unostentatious but cumulatively enormous impact on American social science." 1 As a member of the Committee on Political Behavior (1956-62, 1963-64) and as an adviser to its successor, the Committee on Governmental and Legal Processes, Dahl knows that the Council's impact has nowhere been clearer or more powerful than in the study of political behavior and institutions, especially but not solely as practiced within his own discipline of political science. The earlier committee played a seminal role in the discipline's "behavioral revolution" in research philosophy and methods, and the later committee did much to turn the attention of political scientists to problems of immediate social concern. The two committees' stories are related in many ways, â&#x20AC;˘ The author is Professor of Political Science at the University of Wisconsin-Madison. He has been actively associated with the Social Science Research Council for many years. The recipient of a Senior Award for Research in Governmental Affairs under the Council's program in 1961-62, he made a study of factors affecting selection of parliamentary candidates in Great Britain. He served as chairman of the Committee on Governmental and Legal Processes throughout its existence, 1964-72, and as editor of its major publication, Political Science and Public Policy, Markham Publishing Company, 1968. He was a member of the Council's board of directors for 6 years, 1967-72, and a member of its Executive Committee, 1968-71. During the past two years he has been chairman of the Committee on the Fiftieth Anniversary of the Council. The present article was written at the invitation of the President of the Council as part of the commemoration of that ann iversary. 1 "The Behavioral Approach in Political Science: Epitaph for a Monument to a Successful Protest," American Political Science Review, December 1961, page 764. POLITICAL BEHAVIOR Charles E. Merriam, professor of political science at the University of Chicago from 1900 to 1940, was one of the principal founders of the Social Science Research Council in 1923. He is also generally considered the founder of "behaviorialism" in political science. 3 His pleas, from the 1920's on, for a more scientific as well as more socially useful study of politics had little immediate impact on the discipline's research and teaching, but his students and associates-notably Gabriel A. Almond, V. O. Key, Jr., Harold D. Lasswell, Herbert A. Simon, and David B. Truman-became, with the collaboration of Pendleton Herring, the leaders of the post-1945 movement which sought all and achieved many of Merriam's objectives. A first Committee on Political Behavior had been appointed by the Council in 1945, with Herring as its chairman and Herbert Emmerich, Charles Hyneman, and Key as the other members. However, exploration at that time of the feasibility of developing a new approach to the study of political behavior proved not to be pos2 A comprehensive and detailed summary of the personnel, activities, and products of both committees is presented in "Committee on Political Behavior, 1949-1964, Committee on Governmental and Legal Processes, 1964-1972," Social Science Research Council, August 1973. a Albert Somit and Joseph Tanenhaus, The Development of Amerimn Political Science: From Burgess /0 Belu/Tiioralism, Allyn and Bacon, 1967, pages 110-113.
â&#x20AC;˘ In addition to the chairmen, these were respectively Gabriel A. Almond, William M. Beaney, Robert A. Dahl. Alfred de Grazia, Oliver Garceau, Alexander Heard, Avery Leiserson, Dayton D. McKean; Angus Campbell and M. Brewster Smith; Conrad Arensberg; Edward H. Levi. 5 Committee Brief, Items, June 1950, page 20. 1824-1970," Itellls, December 1971, pages 46--50. 8 Samuel J. Eldersveld, Alexander Heard, Samuel P. Huntington, Morris Janowitz, Avery Leiserson, Dayton D. McKean, and David B. Truman, "Research -in Political Behavior," American Political Science Review, December 1952, pages 10011--1045.
a 7-volume series of studies of the factors and problems of political development which profoundly altered the nature of the cross-national study of politics.9 The Committee on Political Behavior also believed that use of the comparative approach could greatly improve the study of politics in the United States. Wide discussion of a memorandum, "Research in State Politics" prepared for the committee by Oliver Garceau in December 1954, and a conference held by the committee in New York City in June 1955 led to a grant to the Council from the Carnegie Corporation for a program of aid to individuals for research on state politics. This program directly stimulated most of the significant research in that area over the next decade. One result of certain studies promoted by the committee and its successor has been to make all political scientists, including the writer, aware of the difficulty of isolating the impact of a particular governmental or other agency's action on the course of events from that of all the other factors influencing those events. Nevertheless, while we cannot say that the activities of the Committee on Political Behavor were the sole cause of any of the developments mentioned below, they surely were among the most important factors affecting them. The Rise of Behavioralism in Political Science. Since the early 1950's political scientists have engaged in far more explicit discussions of what is being done and what should be done in their discipline than in all its previous history. The authors of the vast relevant literature disagree sharply on the utility and even the morality of the behavioral approach and on whether it now dominates or did dominate or will dominate the discipline's research, publications, and graduate and undergraduate curricula. But I think most would agree on at least the following factual propositions: prior to 1945 the behavioral approach had very little impact on what political scientists did despite the advocacy and prestige of the "Chicago school"; the post-1945 "behavioral revolution" has succeeded at least to the extent that behavioralism is now one of the discipline's most important outlooks, though certainly not its only outlook; it has not driven out all other approaches, nor is it likely to do so; it is equally unlikely that some counterrevolution will roll political science methodology back to where it was before 1945; and the activities of the Committee on Political Behavior constituted one of the prime forces leading to the present state of affairs. I base these propositions partly on my reading of what now appears in political science journals, books, conven9 "Studies in Political Development," 1-7, Princeton University Press, 1963-71. The programs and products of the committee are detailed in "Committee on Comparative Politics: A Report on the Activities of the Committee, 1954-70," Social Science Research Council, March 1971.
pact of manpower trammg programs, presenting new insights and evidence about how such policies are evaluated and extended or terminated. The committee also provided substantial assistance for a study by joel D. Aberbach and jack L. Walker of citizen-administrator interaction and policy development in Detroit following a major racial disturbance.H Comparative Policy Studies. In considering the various projects ju~t described, the Committee on Governmental and Legal Processes came increasingly to the view that current public problems, policies, and their impacts in the United States are essentially similar to those in other postindustrial societies and that its heretofore exclusively American focus could no longer be justified. At the same time, the Committee on Comparative Politics was becoming concerned with expanding its emphasis on process and developmental studies to include research on policy. Accordingly, as both committees neared the end of their missions they each sponsored conferences on the cross-national study of policy impacts and policy performance. These conferences led to their joint proposal for a new Council committee combining these two concerns, and the Committee on the Comparative Study of Public Policy was appointed in 1972, when both of the older committees were discharged. I am sure the members of the latter two committees and of the parent Committee on Political Behavior hope that the new committee will sustain and enrich the tradition of the scientific study of politics they helped to stimulate and broaden. 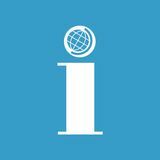 Certainly they are entitled to feel that they have left their impress on the study of politics, on which future committees can build, and that political science and perhaps also the international community are the better for it. 11 Race in the City : Political Trust and Public Policy in the New Urban System, Little, Brown and Company, 1973.
by no means be allowed to continue.-Mao Tse-tung: Directive of May 7, 1966. Societies, and the Social Science Research Council. A report on this program and the agreements between the committee and the Scientific and Technical Association of the People's Republic of China, under which the program is carried out, by Anne Keatley and Albert Feuerwerker, appears in Items, September 1973, pages 27-29.
dren in the labor that they are able to do. Morally, intellectually, and physically, we teach the children along the directions set by Chairman Mao.-Director of Sian Kindergarten # 1. November 28, 1973. THE 13 members of the American Delegation on Early C)1ildhood Development1 went to China late in 1973 under the auspices of the Committee on Scholarly Communication with the People's Republic of China. We were the second American gToup to go to China as a consequence of the committee's negotiations in Peking in the spring of 1973. (We met, both in Peking and Shanghai, the delegation on art and archaeology that had preceded us by a few days.) We entered China from Hong Kong on November 15, 1973 and departed through Hong Kong on December 5; during our 20-day study of child rearing and early education, we traveled from Canton to Peking, to Sian, to Shanghai, and back to Canton. Our official hosts in China were the Educational Circles of Peking, working through the offices of the Group on Sciences and Education of the State Council. We visited 7 nurseries, 13 kindergartens, 5 primary schools, and 3 middle schools, as well as hospitals, health clinics, and the Shanghai Youth Palace. We were obviously "on tour," and the hospitality of the Chinese matched the legend-fine hotels, uniquely excellent fare (shark's lips, aged eggs, mao-tai) and the rest), and a look at the archaeological and artistic splendors of China's past (the Forbidden City no longer forbidden, the Ming Tombs, the Great Wall, the treasures in Sian). Two of our delegation knew Chinese (too few, too few). The interpreters were unfailingly assiduous and often fluent, our hosts were obliging and most gTacious, the hundreds of teachers and thousands of children we saw were uniformly polite, receptive, and hospitable. It was, in brief, a fable-making occasion, shaking all of us to our heels and leaving us, when we got back home, torn between our recognition of the Chinese achievement, so sure in education, and the question whether or not to some American academic intellectuals the cost of the achievement might seem high. We were, of course, interested in all aspects of child rearing and child care from the prenatal period through adolescence and it was unfortunate that the Chinese 1 I speak, diffidently, for the members: Urie Bronfenbrenner, Cornell University; Bettye Caldwell, University of Arkansas; John A. Clausen, University of California, Berkeley; Alexander P. DeAngelis, Committee on Scholarly Communication with the People's Republic of China; Jerome Kagan, Harvard University; Eleanor Maccoby, Stanford University; George A. Miller, Rockefeller University; Harold W. Stevenson, University of Michigan; Jeannette G. Stone, Vassar College; Martin K. Whyte, Universities Service Center, Hong Kong; Joe Wray, Rockefeller Foundation, Bangkok; and Marian Radke-Yarrow, National Institute of Mental Health. of neighbors were seeing a group of educated youth off to the countryside; on every day in between, we heard and saw political imperatives in every school, every entertainment, every park that we visited. Chinese education and Chinese children can be understood only when it is recognized that they exist in an ideological ocean. A little boy sang of his happy brother; when he asked why his brother was happy, the brother replied, "Last night I dreamed of Chairman Mao." In one kindergarten, the first ideograph the children learned was the one for Mao; the first words in English eleven-year-oIds learn are "Quotations from Chairman Mao"; and, when we taught some college-level students an English song ("Deep Blue Sea"), they taught us a Chinese one: On Peking's golden h.ill Shines light forth far and wide Chairman Mao is the bright golden sun Oh how warm, oh how kind Lighting up our peasants' hearts We are marching on the broad and happy socialist road. this impression is largely a call for further study and observation. I can speak from a stronger data base about the attention given in Chinese schools to selflessness and service. The heroes of stories, posters, and textbooks put the group ahead of their own interest; the only approved individualism is apparently the individualism of selfsacrifice. Even in the everyday world, evidence of personal success is muted. The slogan "Friendship first, competition second" is heard from Chinese of all ages. We had no means of assessing the effectiveness of the constant call to "serve the people" in changing the attitudes of children, but we were able to see the steady force of peer pressure, particularly in its organized form in primary school, the Little Red Soldiers. More concretely, we heard a kindergarten teacher ask her class to tell about something that would have pleased Lei Feng (a heroic young soldier-teacher killed in the mid-1960's). To the distress of our host, a four-year-old girl told of a good deed she had done the day before. As he said, "The teacher should have corrected the girl; to speak of one's own good deed is a selfish act." From a mountain of images, memories, and observations, the American delegation drew out two home truths-first, that the relation between teacher and student, parent and child, can only be defined in the context of an entire culture (a fact that makes systematic comparison almost impossible) and, second, that China and Chinese attitudes toward children in 1973 force an examination of American values and American attitudes toward children. Since our return, we have been thinking anew and in new ways about the cultural and ideological forces that have shaped American education. THE GEOGRAPHY OF CHINA: A REPORT ON A SEMINAR by Baruch Boxer ""
• The seminar was chaired by the author, Professor of Geography and Director of the Graduate Program in Geography. Rutgers University. and was organized by him with the help of Marwyn Samuels. University of British Columbia. who was unable to attend. and Joseph R. Whitney. University of Toronto. Others who attended included Kuei·sheng Chang. University of Washington; Norton Ginsburg. Uni· versity of Chicago; Rhoads Murphey. University of Michigan; Ramon H. Myers. University of Miami; James Thorp. Richmond. Indiana; Paul Wheatley. University of Chicago; and Christopher Salter. Uni· versity of California. Los Angeles. of the correct relations between nature and society or of specifically Maoist interpretations of these ideas? Do day-ta-day responses to problems of pollution control. waste recycling requirements. or energy use truly reflect ideological or pragmatic concerns? While the three research areas outlined above are of special interest to geographers working on China. they are significant only to the extent that they point to larger issues in man-environment relations in China. The seminar participants agreed that long-term consideration of this intriguing topic might appropriately fall into four major categories: Chinese environmental attitudes and values; the management of the natural environment in the interest of achieving particular social or political goals; the physical nature of environmental transformation in China. with attention to the uses of technology; and the study of regional variations in the character and form of accommodations to the natural environment. East, South, and Southeast Asia The awards were made by the Dissertation Fellowship Selection Committee for the Asia Program-Gerald S. Maryanov (chairman), Edward Anthony, George A. DeVos, Leonard H. D. Gordon, F. Tomasson Jannuzi, and Susanne H. Rudolph-which met on February 8 and March 9. It had been assisted by the Screening Committee-Robert F. Dernberger, Delmos J. Jones, Robert N. Kearney, Marleigh Ryan, Josef Silverstein, and A. R. Stevenson. East Asia Ronald Aqua, Ph.D. candidate in political science, Cornell University, for research in Japan on policy and politics in Japanese local government Peter Arnesen, Ph.D. candidate in history, Yale University, for language training and research in Japan on local lordship in medieval Japan: 路the Ouchi Domain John Burns, Ph.D. candidate in political science, Columbia University, for research in Taiwan and Hong Kong on Chinese peasant interest articulation since 1949 Samuel Coleman, Ph.D. candidate in anthropology, Columbia University, for language training and research in Japan on social determinants of birth control practices Alison Conner, Ph.D. candidate in history, Cornell Universi-ty, for language training and research in Taiwan and Japan on the law of evidence during the Ch'ing Dynasty Lucy Lim, Ph.D. candidate in fine arts, New York University, for research in Hong Kong, the People's Republic of China, Taiwan, Japan, and Europe on early figural style in Chinese art Michael Moser, Ph.D. candidate in anthropology, Columbia University, for language training and research in Taiwan on religion and community in North Taiwan SEPTEMBER. Latin America and the Caribbean Area The awards were made by ·the Dissertation Fellowship Selection Committee for the Latin American and Caribbean Program-Robert A. Potash (chairman), James M. Malloy, Alejandro Portes, Daniel Schydlowsky, and Rodolfo Stavenhagen-at a meeting on April 15-16. It had been assisted by the Screening Committee-Thomas C. Greaves, Jane Jaquette, Gilbert W. Merkx, Marta Morello-Frosch, Ronald D. Sousa, and John D. Wirth. COUNCIL FELLOWSHIPS AND GRANTS OFFERED IN 1974-75: DATES FOR FILING APPLICATIONS AND ANNOUNCEMENTS OF AWARDS Applications for fellowships and gTants offered by the Council during the coming year will be due, and awards will be announced, on or before the respective dates listed below. Because applications received after the closing dates specified cannot be considered. and because preliminary correspondence is frequently necessary to determine under which progTam a given proposal should be submitted. prospective applicants should communicate with the Council if possible at least three weeks in advance of the pertinent closing date. Inquiries should indicate the nature of the proposed training or research; the approximate amount and duration of support needed; age. occupation or current activity and vocational aim. country of citizenship and country of permanent residence; academic degrees held (specifying the fields of study); and if currently working for a degree. the present stage of advancement toward it. A brochure describing the several progTams is available on request addressed to Social Science Research Council. Fellowships and Grants. 605 Third Avenue. New York. N.Y. 10016. Research Training Fellowships. applications. December 2. 1974; awards. April I. 1975 Grants to Minority Scholars for Research on Racism and Other Social Factors in Mental Health. applications, October 31. 197 4 (changed from October I) ; awards. December 1974 Postdoctoral Research Grants offered under joint programs of the American Council of Leamed Societies and the Social Science Research Council. Unless otherwise indicated. inquiries should be addressed to Social Science Research Council. Fellowships and Grants. 605 Third Avenue. New York, N.Y. 10016. Grants for African Studies. applications, December 2, 1974; awards. March 1975 Grants for Research on Contemporary and Republican China. and for Research on the Economy of Chi!la, applications. December 2. 1974; awards. March 1975 NOTE: Grants for research on Chinese Civilization (pre-1911 China) are offered by the American Council of Learned Societies. 345 East 46 Street, New York. N.Y. 10017. to which inquiries should be addressed. RONALD P. ABELES, MICHAEL W.